In Zambia, Gift Mafuleka would be considered a large farmer, but in South Africa, he is still relatively small. Gift Mafuleka is a young farmer in Bronkhorstspruit, South Africa. He calls himself an emerging small farmer. “In Zambia, I would be considered a large farmer, but in South African terms, I am still relatively small.” Gift says that he is fortunate to own farming equipment such as ploughs, planters and tractors. He also uses these to service nearby farmers who do not have the resources to purchase machinery themselves. He mainly produces (GM) maize, soybean and potato. Some seasons he produces peas and sweet corn. 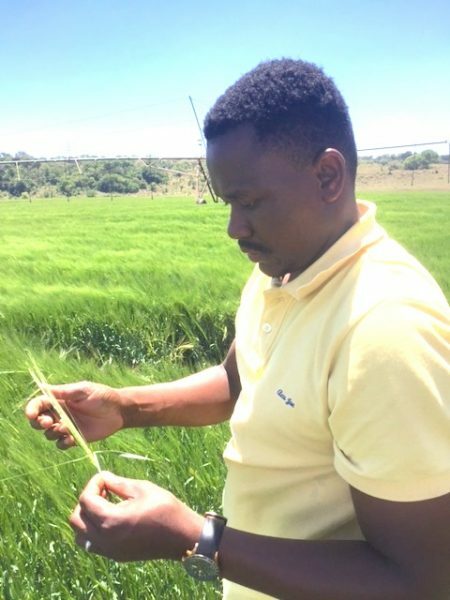 Currently, he is also growing barley as part of a pilot project launched in collaboration with a large brewing company. The crops and varieties he chooses largely depend on buyer demand. “I want to be sure that I can sell my produce, so working with larger buyers is an attractive option,” he says. At the request of another large brewer, he will plant a 100% hybrid maize variety next season. His potatoes are sold on informal markets and fresh produce markets or are bought by large processing companies; his soybeans are purchased exclusively by large traders. As a young ambassador of the Southern African Confederation of Agricultural Unions (SACAU), Gift is helping to strengthen the voice of young farmers in the region.